JavaSketchpad is a Sketchpad extension that allows you to place simple sketches inside web pages you publish on the Internet. These sketches appear as illustrations in your pages, and anyone who visits your web page can interact with them — by dragging points and pressing action buttons — directly from their web browsers, even if they don’t have a copy of Sketchpad. If you create web pages, consider using JavaSketchpad as a way to enhance any mathematics — such as personal discoveries, journal articles, class syllabi, or assignments — that you post to the web. JavaSketchpad is intentionally small in comparison to The Geometer’s Sketchpad so that it downloads quickly when someone visits your web page. Not every sketch or activity you create in The Geometer’s Sketchpad can be turned into an interactive JavaSketchpad illustration. Many of Sketchpad’s advanced features require the full power of the program itself, rather than the slimmed-down version that visitors to your web page interact with. Also, while visitors can drag points and press action buttons in sketches you post as JavaSketchpad illustrations, they cannot draw or construct new objects. Despite these limitations, JavaSketchpad can enhance your web-publishing options significantly. As an Internet technology, JavaSketchpad evolves rapidly, and the best source of information about it is on the web itself. The JavaSketchpad web site is the place to go for additional information; it includes sample applications, technical support, and a full description of the JavaSketchpad construction language that appears in your HTML files. 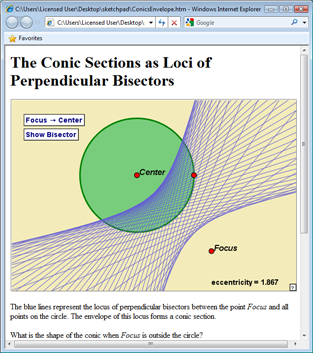 You’ll even find information about some features of JavaSketchpad that aren’t available in The Geometer’s Sketchpad. Visit the site at http://www.dynamicgeometry.com/JavaSketchpad.html.